We humans seem insatiable. Look around. Advertisers know this. More horsepower sells. The next little pleasure, be it for our taste buds, our eyes, our bodies, our minds, tempts us via TV commercials, radio, or printed pages. Subconsciously we look for ‘more’. What other reason do we await and thumb through the next gun magazine? It was in one of those recently where the author shared a simple fact: IMR Trail Boss powder works great for reduced loads. Even in rifles, without having to worry about case capacity. That was the message. Fill the case with Trail Boss and seat a bullet. You can’t fill too much powder in there with Trail Boss. They had done it with jacketed bullets. It got me thinking. First, here was something different to try. More dots got connected … jacketed projectiles have become expensive … I still have all my casting equipment … buddy David has some harder lead ingots ready to go … this Trail Boss powder might be just the ticket with cast bullets. And so it went, I cast some 180 grain .30 cal projectiles and purchased a can of Trail Boss, plus a Lee Universal Case Expander Die. With moulds, lead pot, lubricator and lead on hand, the cost of a projectile drops to about 5 cents, of which the gas check is the most expensive part. Of course it takes more work to cast a bullet then to buy a box of jacketed. But with such activities as bullet casting come both frustration (stronger characters might call it ‘learning’) and feelings of accomplishment. The eventual savings, keeping the needed equipment in mind, soon seem less important than the ‘rolled my own’ satisfaction. The loading process also requires an extra step: flaring the rifle case mouths similar to what we do for handgun ammo. That Lee die will work on any case, by the way. My testing platform was a .308 Winchester. 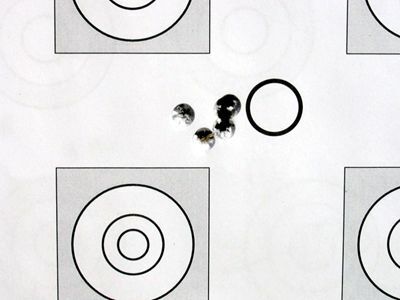 After a little trial and error, 12 grains of Trail Boss produced convincing results, a charge which occupies about as much volume in the .308 case as a typical charge of 44 grains of Reloader 15.
load out of Gerhard’s Tikka .308 at 50 yards. 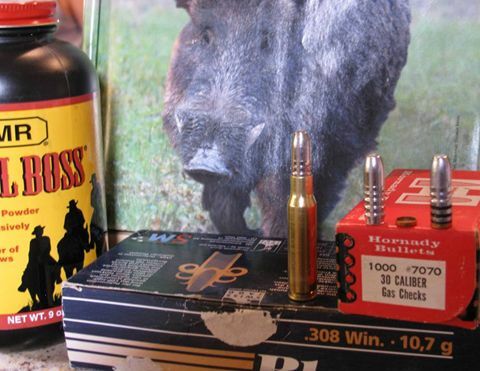 The Trail Boss load pushed the 180 grainers out of the muzzle at about 1250 fps. This, by the way, translates to its own type of joy. Recoil is the wrong term here. The gun mere nudges gently. At 4-power I usually see the bullet impact through the scope. And when 180 grains of heavy metal reaches the target, be it a steel plate or a rock, or anything aside from cardboard, they kick things around, rip off more bark, etc. Fun to feel and watch. The group was fired from a plain Tikka T3 that has managed to become my primary meat gun. Luckily, this tied out since I had hoped to do just that, shoot cheaper ammo in the T3. So I did, that morning. At a hundred paces the lead bullet load had deteriorated to a group of about 2.5 inches. Can’t be sure why, since the ammo printed so well at fifty. Maybe the stuff went subsonic on its way to a hundred, a transition known to long range shooters as pure poison. I did not care. This will not overgrow into a science project. 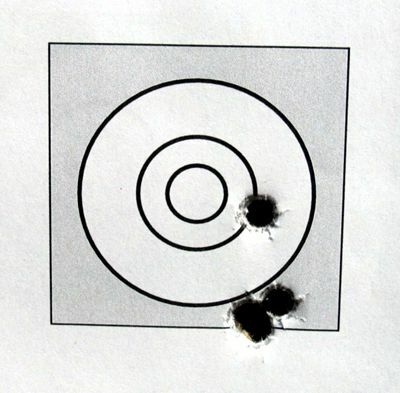 One group at fifty, one at a hundred, and from then on I stood on my hind legs and blasted the rest of my initial batch of lead ammo at an 8” steel plate, also about a hundred yards out. Using the appropriate dot in the scope, all 180 grainers found their target. I wanted to visit the bench one more time. With 33 lead slugs down the bore what would that do to accuracy with jacketed ammo? Here’s the answer, spoken by 100 grain Lapua HPs on top of forty grains of RL7. 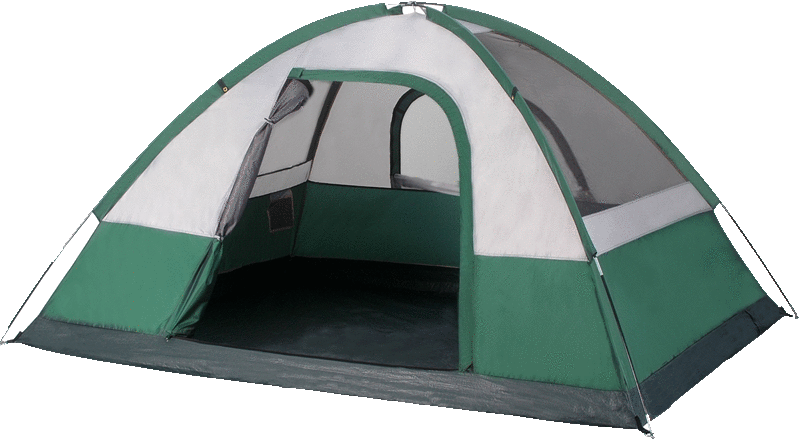 Notice that those Lapuas feature a sharp edge and therefore punch perfect holes in paper. That turned out to be a 0.6” group, plenty of argument that the lead didn’t foul things up. Some of you may remember Annette’s Powder Keg. I had bought a bag of 55gr .224 cal lead bullets some years back. Can’t remember what exactly for. But you guessed it. This summer was lead test time. So I corked a few 223s with them, arbitrarily using 8 grains of IMP 4227 as fuel. Out of a Mini Mauser with 20” barrel they produced about an inch at fifty, and nothing to brag about at 100. Again, no detriment to jacketed bullet accuracy. Mission accomplished. The .224s I will just shoot up. I see no purpose with lead bullets in a 223. That’s what we have rimfires for, even though with the 223 and lead bullets one could load to significantly more speed and power than what a 22lr delivers. Certainly I have no ambitions to cast my own. Purposes for lead pills in a 308 deserve a few more thoughts. Clearly I’ll continue to shoot them in practice, off hand only. One can not do enough of it. This training does not just serve the offhand technique. It also makes the rifle become second nature. Therefore I load the magazine, cycle the bolt, shoot, and repeat until I’ve fired those three rounds. This is mild ammo. Anyone could shoot it all day and not fatigue from recoil. Another thing to consider. Most of us aim too long, supposedly for the perfect moment to squeeze. With a target of something simulating a deer’s kill zone I will use this cheap stuff to condition myself to shoot the first shot sooner. Two more applications come to mind for light (Trail Boss) loads. From now on I’ll have one on me while hunting, as potential finishing round, in an inconvenient pocket so I won’t inadvertently use it. And if in the future I would train a new face for a big game hunt, I would start that person off with such light loads, so that recoil and muzzle blast never enter as challenges. Then I’d adjust the scope over to hunting ammo just prior to opening day. When firing on big game nobody remembers recoil .